Japanese architect Akio Hizume's main subjects for research are architecture, the form of music and quasi-periodic geometry based on the Golden Mean. He not only does research theory but also makes many original works practically. Akio found many quasi-periodic structures and named them "Star Cages". 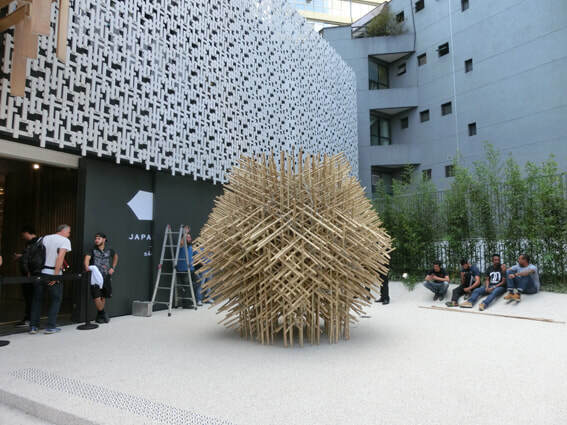 He has built big Star Cages as geometrical sculptures using bamboo in Japan, Indonesia, Austria, Germany, U.S.A. and Switzerland. His latest discovery is a Self-Standing Star Cage without any string, which people can enter into the center of. "It is almost genuine architecture!" He credits the success of his discovery to his first encounter with bamboo. He would like to push his geometrical research and will make many bamboo sculptures anywhere in the world. Generally speaking, they say that it is impossible to experiment on architecture because it is so high cost and big scale. But Akio thinks it is possible by bamboo. He believes they are not only geometry but also avant-garde art. Akio doesn't separate science and art, "both of them are human". He has also innovated musical forms, that is, rhythm, scale and tone. In 1995, he composed a musical piece using the innovations. It was called "Fibonacci Kecak" and published at an International Congress called ISIS Symmetry in Washington D.C. This music is the same form as his quasi-periodic sculpture completely! Akio tries to bring to fruition of forthcoming architecture and music in the world.